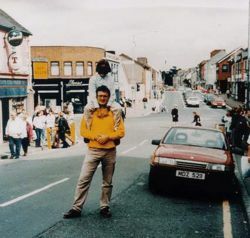 Omagh, Irland del Nord, 15 agosto 1998. La Vauxhall Cavalier rossa carica di tritolo pochi minuti prima dell'esplosione, ripresa casualmente da un turista. La macchina fotografica venne ritrovata tra le macerie. "Peace On Earth" is the eighth track from U2's 2000 album, All That You Can't Leave Behind. It was written about the Real IRA Omagh bombing in Northern Ireland on August 15, 1998. The song lists the names of people (Sean, Julia, Gareth, Anne, and Breda) killed in the Omagh bombing. Similarly, inspiration for the lyric, "She never got to say goodbye / To see the colour in his eye / Now he's in the dirt" comes from the funeral of James Barker, another victim of the bombing. The Irish Times quoted his mother as stating, "I never realised how green his eyes were." After the September 11, 2001 attacks, "Peace on Earth" took on additional meaning and consequently, was used as an encore song in the Elevation Tour, coupled with "Walk On". The two songs were similarly paired during the band's performance on the telethon America: A Tribute to Heroes. 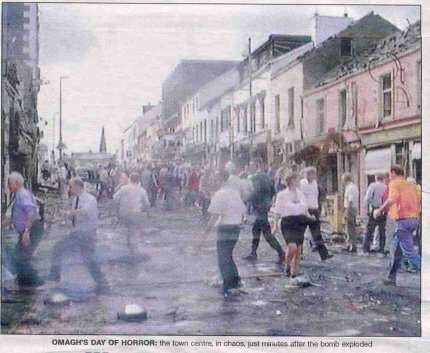 The Omagh bombing was a car bomb attack carried out by the Real IRA on August 15, 1998, in Omagh, County Tyrone, Northern Ireland. The Real IRA comprises a splinter group of former Provisional Irish Republican Army members opposed to the peace process marked by the Belfast Agreement. Twenty-nine people were killed as a result of the attack, including one woman who was pregnant with twins, and approximately 220 people were injured. The attack was described by the BBC as "Northern Ireland's worst single terrorist atrocity". The victims included people of both Catholic and Protestant denominations, and also included Spanish tourists and others on a day trip from County Donegal in the Republic of Ireland. horen dat er vrede komt op Aarde. en we gebruikten ze tegen onze vijanden. Zodat het monsterje niet zal breken. Je dan niet gekwetst raakt? Hun leven is groter dan om het even wel groots idee. Wat is het dus waard? Eso es paz en la Tiera. Sus vidas son más grandes que cualquier gran idea.